‘In Two Minds’ had a number of iterations since its genesis in 1978 when the artist was 27. 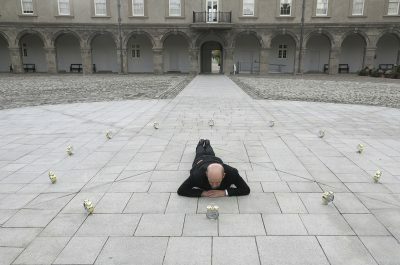 The concept is of the artist having a spirited conversation with himself by way of video installation – a pioneering use of the medium at that time. There is a dynamic in this work between celebration and chaos, that is captured though the duality of perspective of time and of place. It becomes something else over time – revisiting always reveal something new. It is a work that uses the self but is not specifically about the artist – rather it considers what the self is. In 2009 ‘In Two Minds’ has been exhibited in group shows at San Francisco MOMA; MOMA Vienna and at Tate Britain and in 2012 at ICA London. Copyright © Kevin Atherton | Image courtesy of the artist.